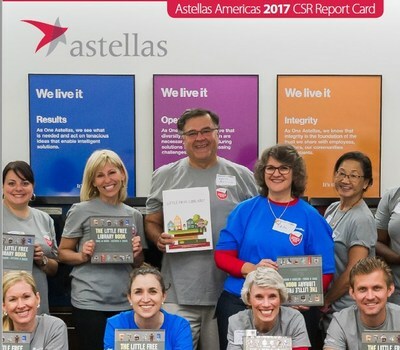 NORTHBROOK, Ill., October 9, 2018 /3BL Media/ -- Astellas today issued its third-annual Americas Corporate Social Responsibility (CSR) Report Card. The Report Card, which can be found here, outlines the company's progress made during Fiscal Year 2017 to fulfill its commitments to patients, employees and the communities where we work and live. "At Astellas, our commitment to improving the lives of others is at the core of what we do. We strive to be kind to one another, the community and the environment," said Percival Barretto-Ko, president, Astellas Americas. "I'm proud of our team's efforts and I am pleased to share our progress in key focus areas in our 2017 CSR Report Card. I look forward to building on this momentum and continuing to help those in need." Astellas is committed to operating in a socially responsible manner to make a positive impact in the communities around the world. By outlining its progress over the past year, Astellas is better positioned to continue its evolution as an industry-leading, responsible and sustainable company. Providing Disaster Relief: In response to an unprecedented season of natural disasters in 2017, Astellas USAFoundation and Astellas worked together to train and send 10 employee volunteers to aid hurricane victims in Houston, Texas, and Orlando, Florida, as part of the Red Cross Disaster Responder Program, one of only four companies to do so.